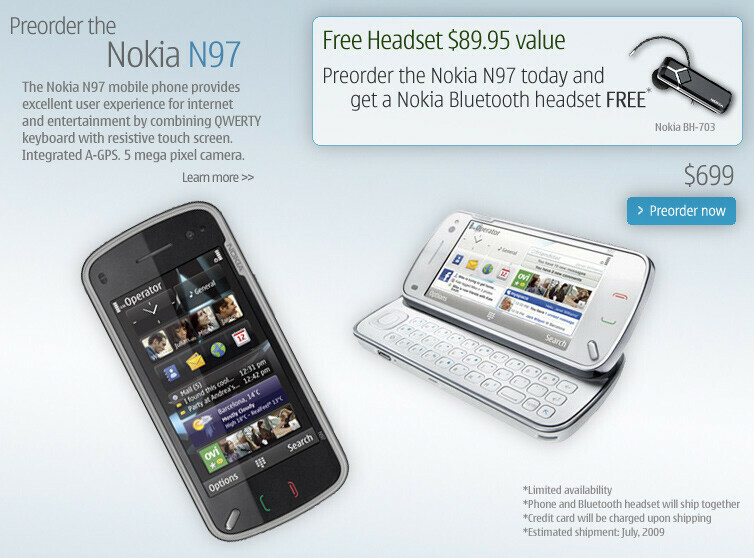 Nokia N97 now available to pre-order in the U.S. Okay, it finally got started... Last week, Nokia put a "Nokia N97 Preorder soon" banner on its USA page, which led to its European site. However, the N97, designed to run on U.S. 3G bands, can now be officially pre-ordered from Nokia’s USA website, with an estimated shipment in July 2009. The new flagship phone comes in two classic color solutions: Black or White. You can get the sweet N97 at the solid price of $699 and you will also receive a present from the company - the Nokia BH-703 Bluetooth headset, which otherwise would cost you $89.95. Let us brush up on its features: the Nokia N97 utilizes a large 3.5-inch touch-sensitive display, 5MP camera, Wi-Fi, 3.5mm jack and whatever you may think of. It’s also going to run the Symbian S60 5th Edition operating system, powering the 5800 XpressMusic. Have it added to your homeowners or renters insurance policy. That will cover loss or theft. Why would anyone pay $700 for this? the Omnia hd most likely wont retail for much more than that, and will be a much better phone, camera, and run on a polished version of S60. So, wheres the value? How about the 32GB of built in storage? Now that alone is a BIG thing in smartphones; it makes for less reliance on your PC to store your important files. Oh and did I mention, you can still expand the memory through Micro SD? At least in my book this phone packs a lot of features in an established OS. Ok maybe the 32GB, but the Omnia hd is going to have 16GB, plus micro sdhc compatability of up to 32GB. Not really sure what some more some one would need on a phone. And the omnia HD is going to run on the Symbian s60 5th ed.w/touchflo overlay. touchflo overlay? You mean the TouchWiz interface; that's based on widgets. I've seen it in action and it's very limited so far; more like eye candy for the time being. Anyway, the N97 will be deploying the Web Run Time environment in the homescreen; effectively allowing multiple functional widgets. Anyway, the N97 is more balanced for my taste, and the price is justified by it's vast sofware and hardware configuration. Besides, it's not like the first time a phone reaches this price. I've seen more ridiculus pricing based solely on gold plating and diamond encrusted with less functionality than either of this two phones.